I will pick the best question for each mailbag and label it as my question of the week. The winner gets a free HCS Koozie to keep your beer cold (Unless you like it warm, but that’s just plain wrong). It was busy question day which tells me that this mailbag is working harder than me at my day job. Unlike the “Big 12 blog” over at ESPN (I say that loosely because one story a month is a tragedy), we here at HCS are determined to give you the best Big 12 coverage on the planet. I want to thank each one of you who submitted a question this week and for those reading, I am glad you could join me. The mailbag was so full this week that I had to break it into two parts so if you don’t see your question in this mailbag, you will see it in tomorrow’s part two of the mailbag. @JSamTTU asks: What are realistic expectations I should set for Matt Wells at Texas Tech? Is there a glimmer of hope that this program can be turned around or are we still in the land of the unknown? Duke: For those who follow me on twitter or just simply read my work usually know one thing about me. I ALWAYS tell you how I feel truthfully. Sure, I like to joke around and have fun on social media but when it comes to giving my opinion on something, I take it seriously. So, Texas Tech fans, brace yourselves because you may not like or agree with what I have to say here but this is my honest answer. Personally, I think Kliff should have stayed at least one more season. The defense has been getting better throughout his tenure there with David Gibbs and if QB Alan Bowman stayed healthy last season, I don’t think Tech lets go of Kliff because last season would have been a completely different story. Now, the move has already been made but look at Matt Wells last four years at Utah State who plays in the Mountain West Conference. 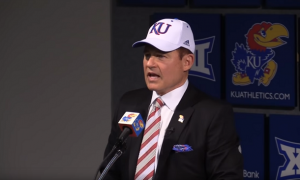 He never won a conference championship (At all during his tenure since 2013) and since the 2015 season his overall record with the Aggies was 25-25. Kliff Kingsbury went 23-27 since the 2015 season. So that means Matt Wells had a winning percent of .500 there and Kliff Kingsbury had a winning percentage of .460. One coached in the Big 12 and the other coached in the Mountain West. Call me crazy but was that worth firing Kliff and bringing in someone who is 25-25 in the last four seasons from a weaker conference? If Kirby Hocutt wanted to fire Kliff that’s fine but at least bring in someone who is a lot better and to me I don’t understand the move from Kingsbury to Wells. Maybe it works out for Tech, but I just don’t see it right now. The good news is that Alan Bowman is their quarterback and if he is healthy, Tech has a chance to win ball games. However, I could see a 6-6 or 7-5 type of season this year for the Red Raiders. Again, I could be flat out wrong but that’s how I feel about the hire. @ia11stat asks: Who is the best QB in the Big 12? 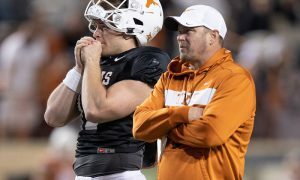 Duke: You mentioned Brock Purdy and don’t get me wrong he is in the upper echelon of Big 12 quarterbacks but right now I must go with Texas quarterback Sam Ehlinger. Last season Sam threw for 25 touchdown passes and threw just 5 picks. He also completed 64.7% of his passes last season and when you compare that to his 57.5% completion percentage, he looks to be poised to have a HUGE year. Don’t think I forgot about his 16 rushing touchdowns last season either. To me Sam is the full package and is a perfect fit for the Texas offense. So as of right now, Sam Ehlinger is the best quarterback in the Big 12. Now could Brock Purdy, Alan Bowman or Jalen Hurts have a great year and possibly be the best quarterback in the Big 12? Sure, but right now give me Ehlinger. @ia11stat asks: Look at this season’s schedule and play it out, who is playing in Arlington at the end of the season? Duke: For those who remember last season around this time I had Texas and Oklahoma making it as my early favorites to Jerry World. Hell, I even went on a radio station in West Virginia (The Brandon Lowe Show) and said the same thing. People thought I was crazy for having Texas there and well Oklahoma, not so much of a surprise. Well guess what? I am sticking with the same prediction from a year ago. A rematch for the 2019 Big 12 title. Until someone knocks off Oklahoma, the Sooners will be the favorite and as for the second spot, give me the Longhorns. I am not sure if you wanted an explanation for my pick but those are my two teams that make it to Jerry World in December. @RPTexan asks: Derek, the new contract for the Big 12 is terrible for all but Texas and Oklahoma. 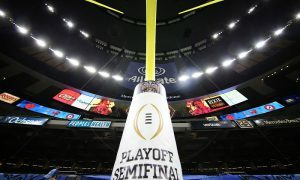 The other schools must give up their third-tier rights and put several games on ESPN+ and in most cases make less money for third tier rights. What are your thoughts on this debacle? Duke: Well Fox and ESPN will still share conference games but ESPN+ will get some of the non-conference games from what I understand. Now I am not expert in the whole “Third tier rights” thing but what it does do is make it cheaper for the consumers to buy ESPN+ at 5 dollars a month compared to paying 20 a month for a Fox Plus subscription. Now I just read something that the Big 12 will receive an extra 22 million per year for the next six years. I have no clue what each Big 12 school makes off their third tear rights but at least their will be some funds back for losing those rights. But like I mentioned before, the whole ESPN+ thing makes it easier for me at least. There were certain non-conference games I couldn’t watch, and I remember how frustrating it was. As much as I like to crap on ESPN, their 5 dollar a month subscription (First month is free), I was able to watch most of those Big 12 non-conference games. Now I will get to see all of them just like everyone else. I for one think that is great because I will pay less money and see all the games compared to previous years. The schools may lose a little, but the consumer has much more to gain here or at least for me. 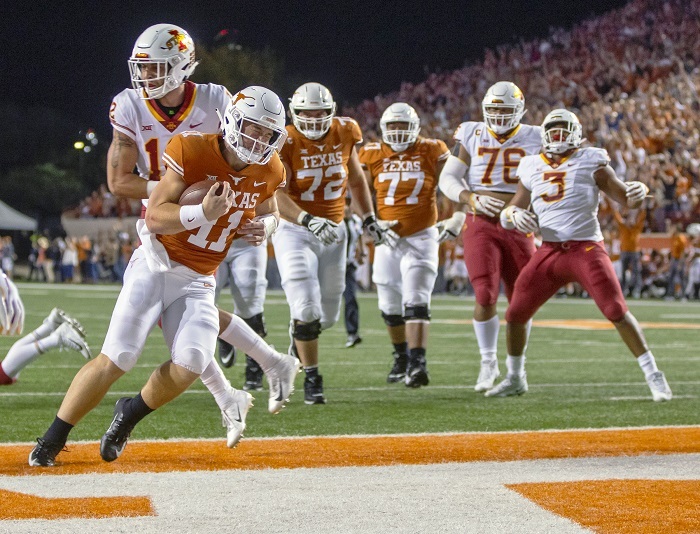 @RPTexan asks: What is your way, way, way too early final record prediction for each Big 12 team along with their bowl game? Duke: Damn it Robert, I had to really think about this one. Now, like you mentioned it is VERY EARLY but let me take a stab at it here. Now, this could change a little as time goes on but here is my full list as of right now.